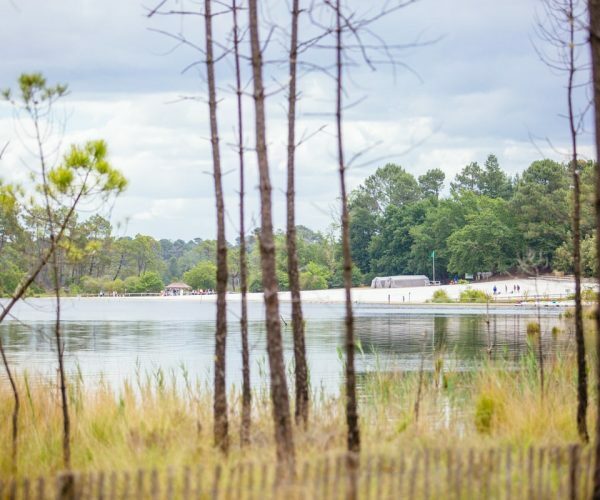 The lakes of South Gironde have lots to offer, whether it’s swimming, fishing or picnic spots. In South Gironde, lakes are an integral part of the landscape. 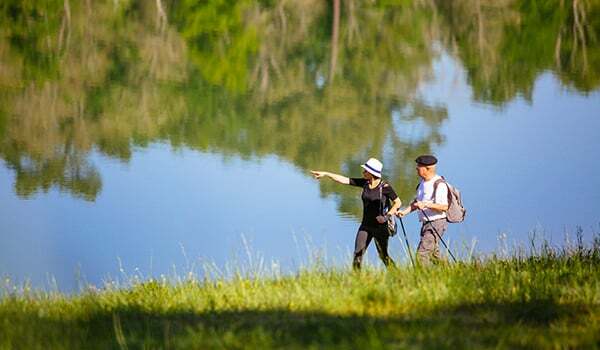 Walking, hiking, fishing, swimming, sports...with friends or family, there are plenty of lakes to choose from whether you prefer lazing on the lakeside or taking off on a nature trail. 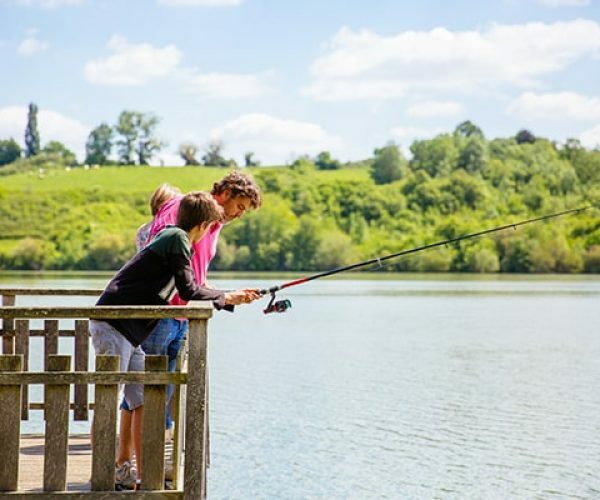 In the heart of the Landes de Gascogne forest, the lakes of Hostens are perfect for a family outing. A fun-filled day with activities for everyone! Covering an area of more than 600 hectares and classed as a Sensitive Natural Zone, the 5 lakes of Hostens are open all year round for hiking, mountain-biking and fishing. During the summer, if you prefer calmer waters to the turbulent Atlantic coast, then head for the lakes of Hostens in South Gironde! The Lake of Lamothe has beautiful sandy beaches, play areas for children and ping pong tables. The water is warm and swimming is supervised from May to September! You can also canoe, kayak or take a pedal boat out on the lakes of Hostens. This is the ideal way to work on your tan and discover the secret coves of the area! If you are passing through Bazas, stop for an improvised picnic in the shade of the poplar trees at the Lake of La Prade. Take a trip to the Saturday market in Bazas first and pick up some Gascony pâté or other specialities. If you have time to spare, bring a fishing rod, too! Observe carp and pike up close from the pontoons is this peaceful setting. After lunch take the Lake of La Prade nature trail to discover wild orchids. When you reach the end, climb to the observation tower and admire the panoramic view of the site. The Lake of La Prade is an authentic natural reserve and a popular resting spot for migratory birds. Guided walks are organised all year round to discover the flora and fauna of the site. 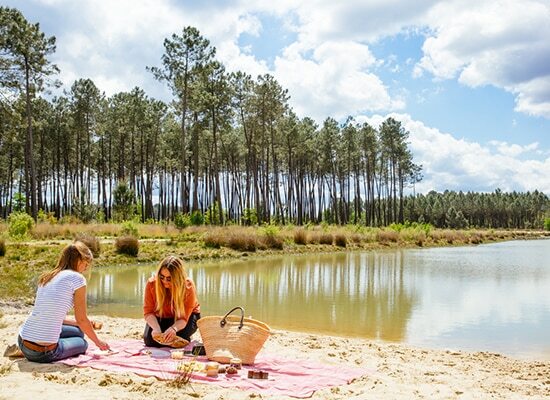 If you’d like to try new activities or just enjoy nature, then the Lake of Taste in Captieux, South Gironde, is for you! On certain days during the summer season, you’ll find free initiation activities for sports such as paddle-board, canoeing, slack-lining and many more! 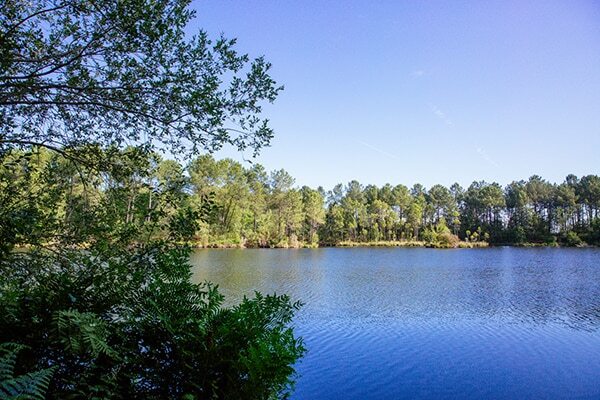 Enjoy a nature walk in the shade of the pine trees along the edge of the Lake of Taste. Stop for a break on the way and dip your feet in the water from the wooden pontoon. The forest surrounding the Lake of Taste also boasts a health trail for sportier visitors! How about a picnic on the small sandy beach, with puits d’amour, the famous local pastry speciality? A very moreish dessert! Spend a day at the Lake of Castagnet, and meet its owners, Nicole and Laurent. Shaded picnic tables surround the lake in this oasis of green. There is a play area for children, who will also love to see the geese that wander freely around the site. The Lake of Castagnet is also a trout-fishing spot. If you prefer a good book, settle down by the lakeside and enjoy the calm. The Lake of Sigalens in South Gironde is a well-known fishing spot. Pike-perch, pike and carp inhabit these waters to the delight of fishermen! The Lake of Sigalens is also a refuge for nature lovers. A marked trail will take you on an hour’s walk around the lake. Enjoy the fresh air and the nature around you! Break for lunch at the shaded picnic area.